A record-low 759 tornadoes formed in the U.S. so far this year, according to the National Oceanic and Atmospheric Administration’s Storm Prediction Center (SPC). “This lack of tornadic storms in recent years should also correlate with lesser severe thunderstorm activity in general in the U.S., since the conditions which produce large hail and damaging winds are generally the same as are required for tornadoes,” Dr. Roy Spencer of the University of Alabama-Huntsville wrote on his blog. 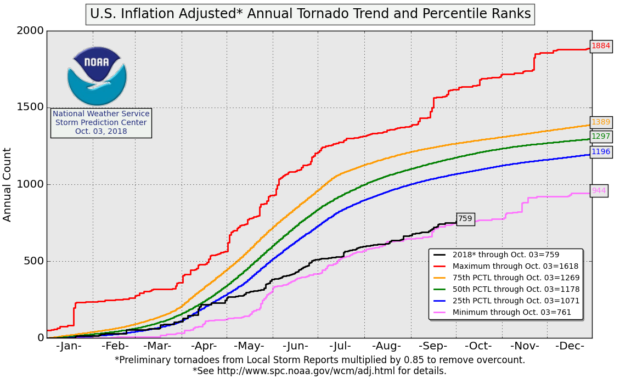 Meteorologist Steve Bowen noted on Wednesday there’s been 1,961 consecutive days without an F5 tornado in the U.S., based on the Fujita tornado intensity scale. Bowen tweeted this is the second-longest streak without F5 tornadoes since 1950. An F5 is the most extreme category of tornado, bringing wind speeds as high as 318 miles per hour. An EF5 tornado, based on the Enhanced Fujita scale, can do “incredible” damage to areas it hits. The EF scale was created to estimate wind intensity based on the damage a tornado causes.